Nigerian singer, Pepenazi has taken to his Instagram page to gush about singer, Simi and her style of music. The singer will not be the first celebrity that would be crushing on Simi. 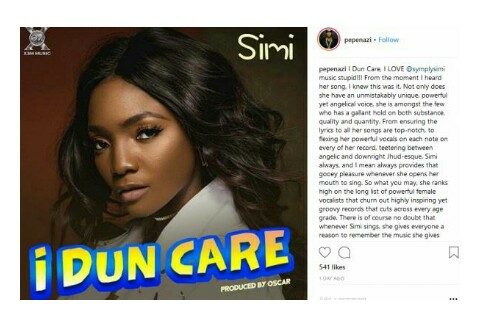 According to him, Simi has an an unmistakably unique, powerful yet angelical voice, and the lyrics to all her songs are top-notch. In response to the praise showered on her, Simi commented on his post with love emojis to acknowledge Pepenazi’s appreciation of her music as well as her personality. I Dun Care, I LOVE @symplysimi music stupid!!! From the moment I heard her song, I knew this was it. Not only does she have an unmistakably unique, powerful yet angelical voice, she is amongst the few who has a gallant hold on both substance, quality and quantity. From ensuring the lyrics to all her songs are top-notch, to flexing her powerful vocals on each note on every of her record, teetering between angelic and downright Jhud-esque, Simi always, and I mean always provides that gooey pleasure whenever she opens her mouth to sing. So what you may, she ranks high on the long list of powerful female vocalists that churn out highly inspiring yet groovy records that cuts across every age grade. There is of course no doubt that whenever Simi sings, she gives everyone a reason to remember the music she gives the world. Go cop “I Dun Care” if you haven’t.